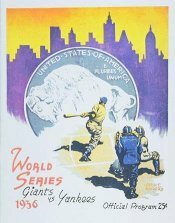 The 1936 World Series matched the New York Yankees against the New York Giants, with the Yankees winning in six games to earn their fifth championship. 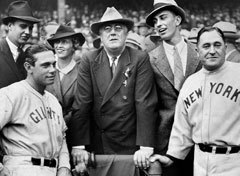 The Yankees played their first World Series without Babe Ruth and their first with Joe DiMaggio, Ruth having retired from the Yankees after the 1934 season. Carl Hubbell won Game 1 but it was mostly downhill after that for the Giants. The Yankees won Game 2 at the Polo Grounds by an 18–4 count, still a Series record (as of 2008) for lopsided scoring. DiMaggio made all three ninth inning outs in that game, the final a long fly off Hank Leiber that the smooth-fielding young Yankee Clipper snared and then kept running all the way up the clubhouse steps. DiMaggio would go on to be the only person to play on four World Championship teams in his first four years in the big leagues, the 1936–39 Yankees. Yankees left fielder Jake Powell started the year with the Washington Senators before coming over in the middle of the year in a trade for Ben Chapman. In this Series, the unheralded Powell would lead all hitters in hits (10), batting average (.455), runs (8), bases on balls (4), add a home run with five runs batted in, and grab the Yankees' only stolen base. In 1936, the New York Yankees were not only without their best player, but also perhaps the greatest player in the history of the game. Prior to 1935, the Yankees had released the legendary Babe Ruth, who went on to play briefly for the Boston Braves, and shortly thereafter retired from baseball. Many felt that "The Babe" was directly responsible for the Yankees' dominance of the late 20's and 30's and the prospect of returning to post-season glory without him was grim. If New York would be able to prosper without Ruth in the line-up; it would be a tremendous boost for the future of the franchise. Ruth's "replacement" was an up-and-coming rookie outfielder named Joe DiMaggio who hit twenty-nine homers and one-hundred twenty-nine RBIs in his debut season. Third only to Lou Gehrig and Bill Dickey, "Joe 'D" as he would later be called, was a perfect fit for the old "Bronx Bombers". Gehrig was coming off of a MVP season in which he hit forty-nine homeruns and drove in one-hundred fifty-two with a .354 batting average. Dickey hit twenty-two homers with one-hundred seven RBIs and led the team with a .362. Pitching was also a major player in the Yankees 1936 season as six hurlers finished the regular season with double-digit wins. Their records include: Red Ruffing (20-12, 3.85 ERA); Monte Pearson (19-7, 3.71); Bump Hadley (14-4, 4.34); Lefty Gomez (13-7, 4.38); Pat Malone (12-4, 3.80); and Johnny Broaca (12-7, 4.24). Not only had New York proved themselves to be worthy without Ruth during the regular season, they were on the verge of a World Series streak that would last for the next four years. The Yankees return to the Series also coincided with the comeback of the National League champion New York Giants who were returning to the big show after a three year hiatus. Although the Giants did not share the dominant pennant run that the Yanks had (winning by only five games), they did have the most dangerous pitcher in all of baseball. Carl Hubbell, a thirty-three year-old lefty, had just won his last sixteen games and finished the season 26-6 with a 2.31 ERA. Hubbell had more than earned the start for Game 1 and went up against twenty-game winner Red Ruffing. Mid-season acquisition, Jake Powell (who came over from Washington) was obviously not intimidated by the Giants' "giant" and managed three base hits in his first three attempts. It mattered little as Ruth's replacement in rightfield, George Selkirk, scored the Yankees' only run with a homer in the third inning. Hubbell struck out eight and only allowed seven hits (none of which flew past the infield) on his way to a 6-1 opening lead. Despite the miserable debut, the Yankees went on to win four of the next five games while paying back the Giants' pitching staff for Hubbell's performance. In Game 2, they took Hal Schumacher and four relievers for seventeen hits including the second grand slam in World Series history by Tony Lazzeri. The entire line-up (all nine) had at least one hit and scored one run in the 18-4 massacre (Bill Dickey and Lazzeri each had five runs batted in apiece). The following day, newly acquired Bump Hadley delivered a 2-1 victory with a tie-breaking run knocked in by Frankie Crosetti in the eighth and solid relief from Pat Malone in the ninth. Hubbell returned to seek revenge for his counterparts in Game 4, but suffered their same fate, allowing four Yankee runs (two off Gehrig's second homer in as many days) in the first three innings. Despite his best efforts, the Giants' ace was bested 5-2 by Monte Pearson, a recent trade-acquisition from Cleveland. On the brink of elimination, the Giants managed to stay alive with a crucial 5-4; ten-inning victory in Game 5, but it only postponed the obvious. Once again, the Yankee sluggers stepped up to the plate and blasted their cross-town rival's pitching staff in an embarrassing 13-5, Game 6 romp. Powell, Lazzeri, DiMaggio and Rolfe each had three hits (with Powell adding a homer and four RBIs) as the Yankees wrapped up the Giants and another World Series title. In the end, the Yankees had finished the contest with an amazing sixty-five hits. Powell batted .455, Rolfe hit .400, DiMaggio batted .346 and Gehrig knocked in seven runs while boosting his RBI total in Series play to 31 in 25 games. The only highlight for their opponents came on opening day as Hubbell's Game 1 masterpiece ended the newly crowned champion's twelve-game winning streak. However, it would be of little consolation to the fallen Giants (and the rest of the National League) as the Yankees were about to start a new winning-streak of a different kind. Screwball pitcher Carl Hubbell, who paced the National League in both wins (26) and ERA (2.31), mastered the Yankees in Game 1, scattering seven hits in nine innings for a 6-1 victory. The outcome was in doubt until the bottom of the eighth, when the Giants scored four times. The slugging Yankees lived up to their reputation in Game 2, hammering five different Giants hurlers for 17 hits and 18 runs. Bill Dickey and Tony Lazzeri each drove in five runs, four of Lazzeri's RBI coming on his third-inning grand slam, only the second in Series history. Lefty Gomez was the beneficiary of that offense, going the distance to gain credit for the 18-4 blowout. Game 3, in Yankee Stadium, was an entirely different kind of affair. Lou Gehrig homered in the bottom of the second inning, Jimmy Ripple homered in the top of the fifth, and after seven-plus innings the score was still tied at one. In the bottom of the eighth, the Yankees scored on Frank Crosetti's single off the glove of starter Freddie Fitzsimmons' glove, and Pat Malone pitched a scoreless ninth to save the American Leaguers' 2-1 victory. The Bombers made it three straight with a 5-2 win in Game 4, with Monte Pearson going nine innings to beat Hubbell. In Game 5, the Giants went up 3-0 -- on a trio of RBI singles in the first inning, but Yankees starter Red Ruffing settled down and the score was 4-4 after six innings. In the top of the 10th, player-manager Bill Terry gave the Giants a 5-4 edge with a sacrifice fly to center field. The game ended that way when Yankee pinch-runner Bob Seeds was thrown out trying to steal second base. Hal Schumacher was the winner, pitching all 10 innings. Game 6, back in the Polo Grounds, was a see-saw contest, the Yankees clinging to a 6-5 lead after eight innings. Then the Bombers bombed away in the ninth, scoring five runs before the Giants could record a single out, and they wound up with seven in the inning. The final score: 13-5, with the sYankees winning yet another World Series.